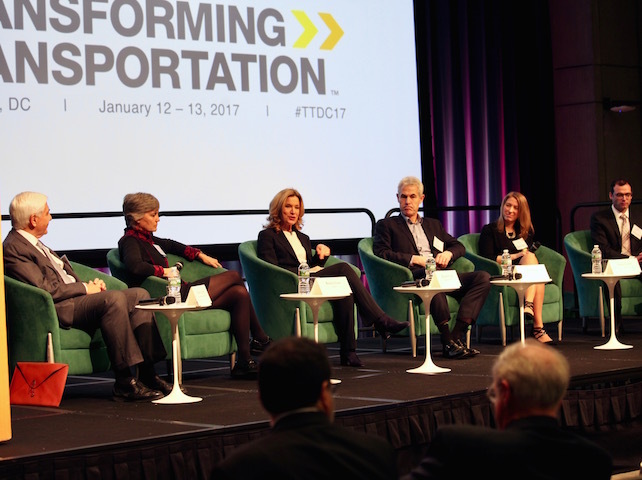 Transforming Transportation (#TTDC17) is the annual conference co-organized by the World Bank and the EMBARQ mobility initiative of WRI Ross Center for Sustainable Cities. This year’s conference is themed Beyond Commitments: Sustainable Mobility for All, and takes place on January 12 and 13, 2017 in Washington, DC. 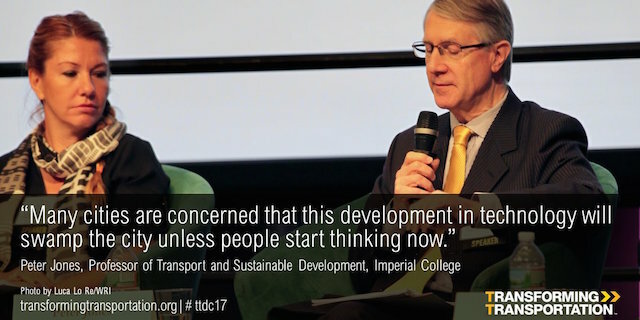 Join the conversation on social media with the hashtag #TTDC17, by following @WRIcities and @WBG_Transport on Twitter, and tune in to https://live.worldbank.org/transforming-transportation-2017 for video streaming of select sessions. New kinds of mobility—ride sharing platforms, electric cars and buses, autonomous vehicles—are creating disruptions in the transport sector. 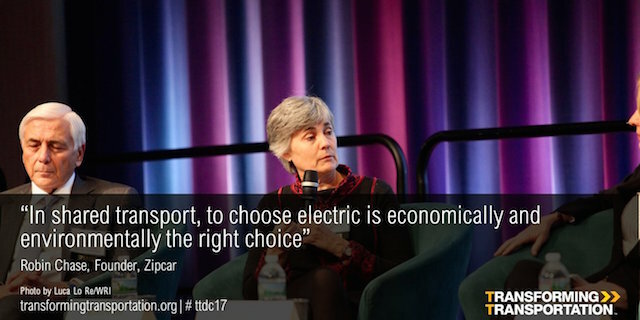 Thanks to big data and the widespread use of smart phones, personal transport planning around the world is increasingly becoming a continuum, where people can use a number of different integrated modes to make seamless, efficient trips, as Robin Chase, Founder of Zipcar, explained. While the evidence is still mixed on the current impact, the hope is that all this will get people away from personal car ownership. Emily Castor, Director of Transportation Policy at Lyft, pushed back against the idea that one technology alone will create positive economic and social impact. Instead, she pointed out, technologies need to be integrated to ensure that they work in a way that creates public good. When it comes to mobility, disruptive technologies like automation, electrification and on-demand ride-sharing need to be integrated in order to mitigate the individual technologies’ potential downsides, like greater congestion and traffic fatalities. As Sam Parker, Director of Shell Foundation, noted, there are barriers to making new mobility technologies achieve social good. For many low-income populations, ride-sourcing apps like Uber and Lyft are prohibitively expensive given their scale. “We’re going to need to think about how we reach this population so that innovation works for them. Don’t assume the technology will do everything—success depends on the business model.” Emily Castor added to this by pointing out that personal vehicle ownership is currently cheaper than shared mobility, which will need to reach a viable price point in order to create benefits for all. Getting to this point is going to require smart regulations and public policies. This is a huge challenge given that decision makers will need to balance a legitimate concern for safer and public good while also providing the private sector with the right enabling environment for investment and entrepreneurship. One of the biggest challenges here is the status quo—the lack of collaboration thus far between the private and public sectors to improve urban mobility for all. Will the mobility transformation have an impact on traditional transportation? Toni Lindau, Director of WRI Brasil Sustainable Cities, seems to think it will. Lindau believes that autonomous vehicles will pose a great challenge the current transit market: conventional buses, bus rapid transit routes and other feeder systems will be at risk. How Will 2017 Shape the Transport Agenda?